Home > Insurance Blog > Job Burn Out? Shopify, an e-commerce company that develops software for online stores, has implemented a hybrid work environment with elements of traditional corporate offices and open concept workspaces at its headquarters in Toronto, Canada. As open concept offices are hardly new, and it’s notoriously difficult to impress media, what’s afoot here? 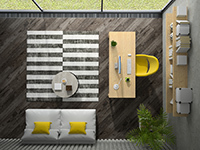 Witness “Sofa Boxes” – rooms on wheels, with noise-canceling cushions and one see-through wall. It’s private, but still in the open; it can be pushed together for meetings; and, bonus…it’s comfortable! Innovation # 2: The desks, on the other hand, are the ultimate in communal working. Called “hot desking,” they’re a nod to the fluidity of work at Shopify; desks are identical – no one has a defined space. The focus of the layout, as designed with assistance from a design firm and Shopify employees, totally reflects the employees and the work they do. Now there’s a concept! Exercising regularly and sleeping seven to eight hours a night. Drone technology is sweeping today’s business world. In businesses from real estate companies to construction firms to agricultural organizations, drones are used to capture aerial views for a variety of surveying and marketing efforts. As prices drop and the technology becomes increasingly accessible, more and more businesses are turning to drones to do what humans can’t. This new technology provides new business opportunities, but it also comes with new insurance needs. Commercial drones can cost anywhere from $1,000 to $100,000. They also add liability risk, with the potential to cause damage to property or personal injury if the drone malfunctions. Insurance is needed. With these costs in mind, business owners employing drones must consider what insurance coverage to obtain. Several options are available: you can add unmanned air vehicle coverage to your liability and property insurance, take out a separate drone insurance policy to cover liability in case of an accident, or take out a separate drone insurance policy to cover both the drone and liability. A solid policy protects you against damage done by or to your drone. It covers a wide range of circumstances including liability coverage for ground crew and independent contractors, manufacturers’ liability, medical payments, personal injury, and damage to your own property and contents. Which option is best will depend on the activities the drone will undertake and its cost. Companies using fairly inexpensive drones may not find it cost-effective to obtain damage coverage. However, liability coverage is wise and, in fact, may be required under certain circumstances. It’s about more than just the law. Obtaining insurance for a single drone or a fleet can provide additional advantages for your business. Many clients these days are likely to be interested in using your drone capabilities. And because some of your clients might not want to work with someone who isn’t fully insured, a drone policy will attract business by proving that your company is professional, reputable, and worthy of their business. Obtaining drone coverage is similar to obtaining auto insurance. If you demonstrate you are safe and prepared, you are more likely to get better rates. Most insurance companies want to see maintenance logs, operating manuals, and a record of enhancements made to the drone. You should also ensure all pilots (operators) are well-trained and provide proof of this training for your insurance company. These items lower the risk to your drone and the risk it poses to others. This, in turn, lowers insurance company costs. Costs for drone insurance varies, depending on these risk factors as well as the value of the drone and its use. Typically, coverage can be obtained for as little as $900 a year. Considering the potential cost that could result from just one incident, this expense is well worth it. If your business currently uses drones (or could benefit from using them), discuss the various options for commercial drone insurance with your agent.